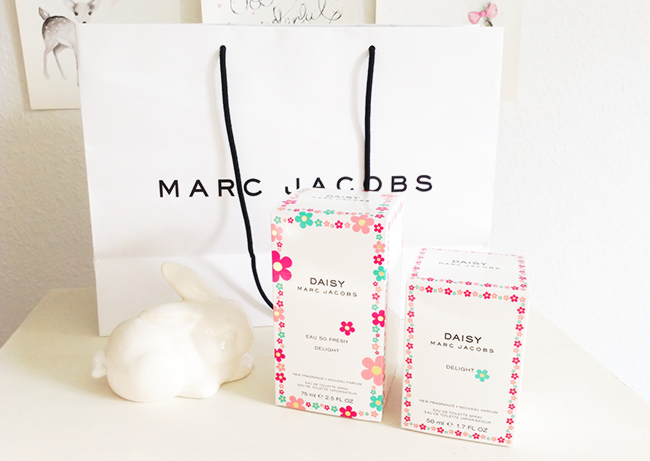 Marc Jacobs Daisy fragrance is definitely one of the most popular scents in the market. Since the original Daisy scent was launched, we have also seen many other Daisy variations and editions. For the Spring of 2014, Marc Jacobs fragrances launched two new limited edition scents, Daisy Delight and Daisy eau so fresh Delight. Daisy Delight contains top notes of apple, quince flower, fressia, heart notes of iris, gardenia, peony and base notes of musk, cedarwood and sandalwood. I'd say it smells like a lighter and fruitier version of the original Daisy. Daisy eau so fresh Delight contains top notes of blood orange, pink pepper, white tea, heart notes of Tahiti tiare, violet, raspberry and base notes of apricot, musk and amber. It's a lot more sweet than Daisy Delight. I would also call it a stronger and sweeter version of Daisy eau so fresh Sunshine edition. As always, Marc Jacobs fragrances bottles are playful and elegant. With it's cheerful and vibrant bouquet on the cap, aquamarine colored liquid for Daisy Delight and pink liquid for Daisy eau so fresh Delight, both bottles are just beautiful to look at. I love to display my Daisy bottles on the dressing table as they really make a statement interior detail! To sum up, both scents are just gorgeous. I'm a real fan of Daisy perfumes family, and I'm happy to have these new bright and fresh additions for the upcoming season as they are just perfect for the spring time. Marc Jacobs Daisy Delight limited edition fragrances will be available from February 24th in Matas, Magasin, Sephora and Salling stores in Denmark, priced 510 DKK for the 50ml EDT Daisy Delight and 550 DKK for the 75ml EDT Daisy eau so fresh Delight. They are popular so they must be pretty good and the way you describe them sounds like something I'd love...beutiful photos by the way! Love the combination of colours <33 beautiful pics, as always! They have the best perfume packages! 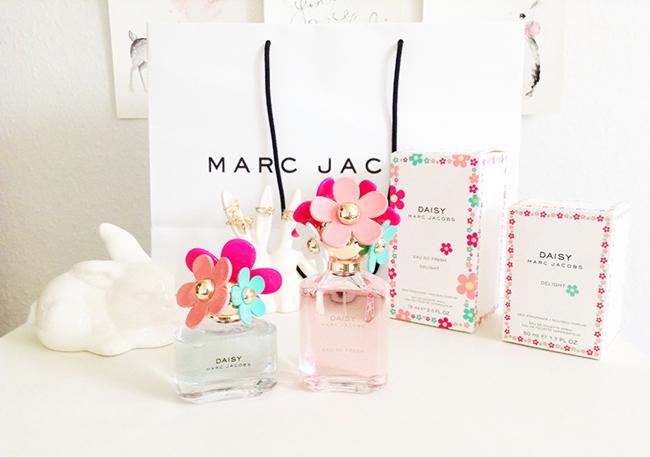 I love Marc Jacobs Daisy perfume. oh MJ fragrances are my favorite!! thx for visit my blog! I love the Marc Jacobs bottles but I'm not a massive fan of their scents which is such a shame. Marc Jacobs is just about my favourite perfume, next to chole. I absolutely love Marc Jacobs fragrances, the bottles are delightful and are a fabulous addition to any dressing table! your blog is so lovely! thank u for visiting me, now I'm following u back! OMG your blog is gorgeous! I may be the only person who isn't fan of these scents, but I must admit the bottles look so cute! I love Marc Jacobs just for their bottles alone. Such a bad reason to buy them, but they just look so gorgeous on a dressing table! Both sound lovely! I'll definitely have to check them out. Always lovee Marc Jacobs perfumes, should try it! Wow this looks amazing, I love the packaging!! I need to give this a smell!! Lovely post and fab imageS! Im using Victor & Rolf Flowerbomb at the moment but would love to try a Marc Jacobs fragrance next! I love this Parfum, amazing colors and pics dear! I love these fragrances. Its such a great brand. Your photography is gorgeous. Obsessed with Marc Jacobs fragrances! I love everything from Marc Jacobs! ooh i'll have to go and try these! So glad I found your blog - love this perfume and it's packaging! I have never heard about this scent, but it looks amazing! Lovely blog doll - so flawless.. I've never smelt any perfumes by Marc Jacobs this post has definitely made me want to! i love this one!!! It's perfect for one woman!!! Loved your blog (: I'm following you, thanks for your visit! The packaging on this is beautiful, I'm sure it smells amazing. I'm literally obsessed with your blog, following you now! I love this perfume! It's always been one of my favorites! i don't know how it smells! i must go to the store and try it! These are my favorite bottles so far - I love the colors! I'm going to have to track them down and smell them - I love fruity perfumes but it's never safe to take the plunge without testing! wow this is so cute! I am in love with the packaging!! Love your blog!! new follower!! The bottles are so pretty and fun! 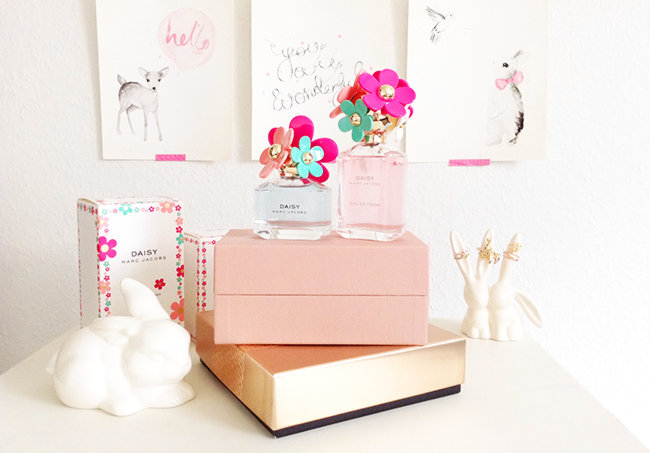 I wear Daisy Eau So Fresh, love it! Daisy is so beautiful yes. Brilliant idea of use daisy on the bottle. I really love the package! Very lovely! Actually I am using the latest fragrance of Roberto Cavalli. Now I am curious to smell the new fragrance of Marc Jacobs! They look pretty good, I would like to give them a try! I just love the bottles of the Marc Jacobs bottles! They are so cute! I'm a huge fan of MARC JACOBS's bottles they are always so beautiful!!! These bottles are truly so beautiful. O live your blog - you have a new fan! Great blog btw! I just followed!